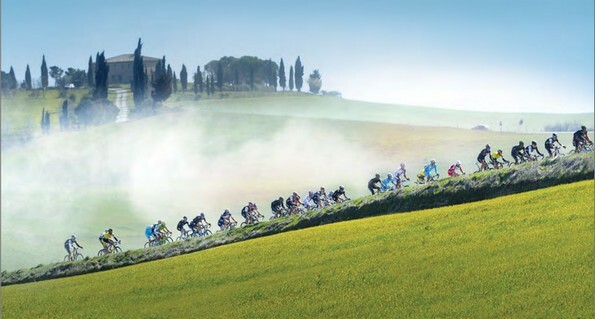 Strade Bianche means many things. Literally, in Italian it means “white roads” and refers to the unsealed roads in the Tuscan hills that the race travels over. For photographers and people who will watch the race on screens, it is the most beautiful race in the world. For riders it means something much less romantic – “you either make dust or you eat dust”. All the basic information about this fantasy cycling game is in a previous article, so make sure you read that first. You can still register to play the game and join our league even though it’s started. 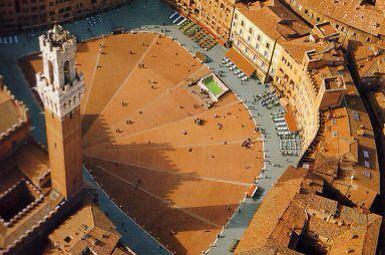 The race is from San Gimagnano to Siena, the long way (200km). There are 10 gravel sectors. The last 3 coming in the last 30 km of the race. The profile doesn’t look testing, but the little hills are relentless and many are quite steep. Add some gravel and that makes the climbs more taxing and the descents more dangerous. It will be a fast race as riders charge to be in good position before each of the gravel sectors where the peleton will string out on the narrow tracks through the gravel with often only a thin riding surface available. With about 40km to go it is likely that the lead groups will be down to 30 riders. 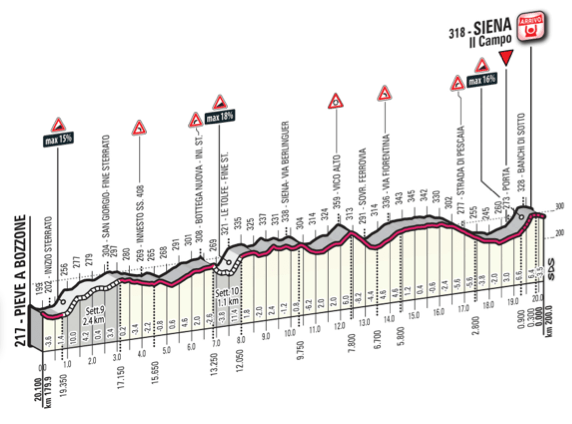 The race will be decided over the last 20km (profile below). 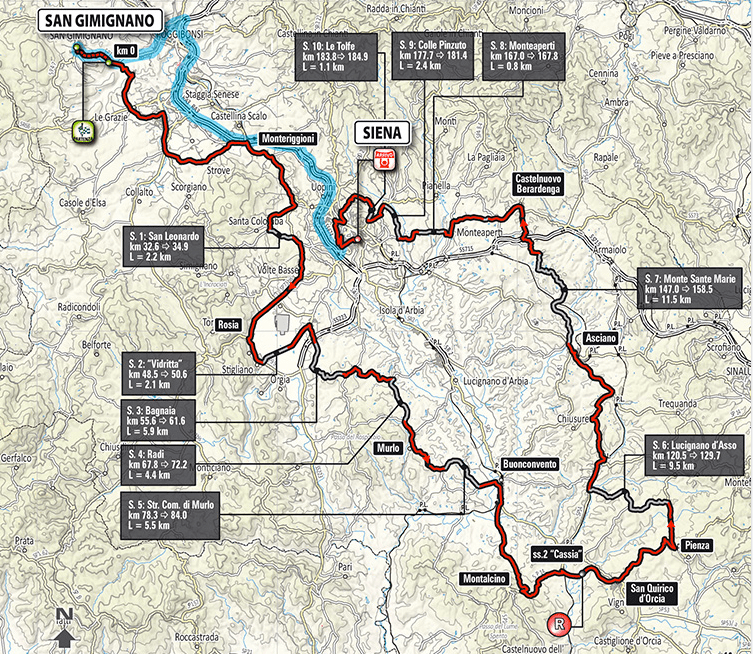 The final 20km includes 2 gravel sectors with climbs of 15% and 18%. Then the final 1.5km is a steep climb (16% spikes) through a medieval gate and laneway in Siena, to finish at the famous Piazza del Campo, home of the palio horserace. Lockout is Saturday 7 pm AESST. The idea you could plan your trades strategically for this competition lasted just one race. It’s bad enough having weather, startlist riders and injuries/form as unknowns, then suddenly prices and total number of trades became variable as well! So the planners got disadvantaged compared to players just taking it 1 race at a time. A 5 man team with almost unlimited trades and budget of approx 140 credits. A 3 man purist team with no trades and budget of approx 10 credits. And the scores of both are added together. I restructured my team for last race Kuurne-Brussel-Kuurne to free up a lot more cash for the now more expensive riders to chase points for podium positions going forward. I don’t think there is any other viable strategy. 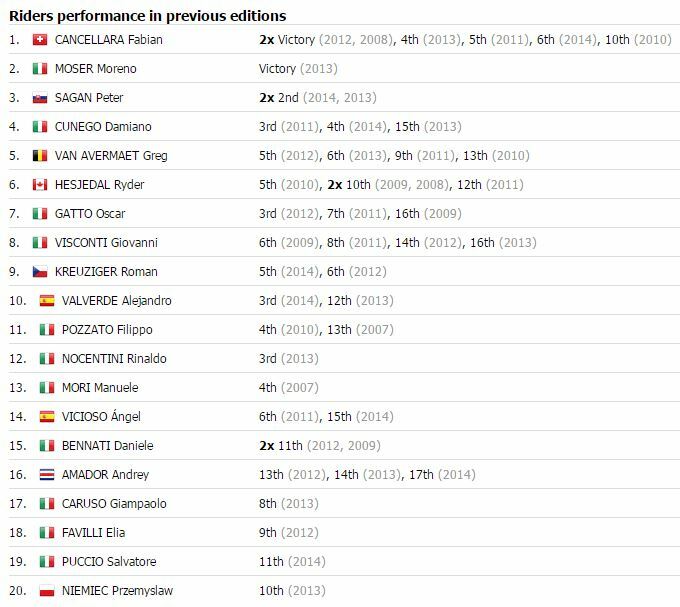 The 20 riders in this race with the best previous form in this race are listed below (click to make it bigger) .. The weather forecast is for a sunny day with no rain, but a 25 km/hr NNE wind for the finish of the race. This wind will be at about 45 degrees when the field is strung out on the long 11km gravel sector at about the 150km mark. It will shatter the race to pieces. Only pick riders who are good enough, and in good enough teams, to be in the leading groups at that point. Peter Sagan at 40.0 is expensive, but after second in last 2 years and with a new team, he cannot be ignored. Greg Van Avermaet at 29.7 has the skills to podium here, and a very strong team. The concern is whether his recent drug inquiry is bothering him. Fabian Cancellara (25.6) has the dominated this race before, and is in good form. He doesn’t need a team! Alejandro Valverde (37.2) has a good chance of finishing on the podium, but he looks a little over priced. If it comes down to a choice between Sagan and him, Sagan is probably a better choice. Etixx-Quickstep have Zdenek Stybar (24.3) and Niki Terpstra (22.9) and their team should have them well positioned for any wind splits. Stybar should be able to handle the uphill sprint at the end. Ian Stannard (22.6) is here again. I wouldn’t have thought of him for this, but he was in great form on the cobbles. Vicenzo Nibali (23.8) is in his first try at this race. I think he could go well if he isn’t just here for a training run. Moreno Moser (10.3) is very underpriced. He won this race 2 years ago. He had good form in Australia at TDU and Cadel Evans race earlier this year, and can climb and sprint at the end of the race. He’ll get the support of his team (although Cannondale-Garmin aren’t recognised as being among the smarter teams in the peleton). 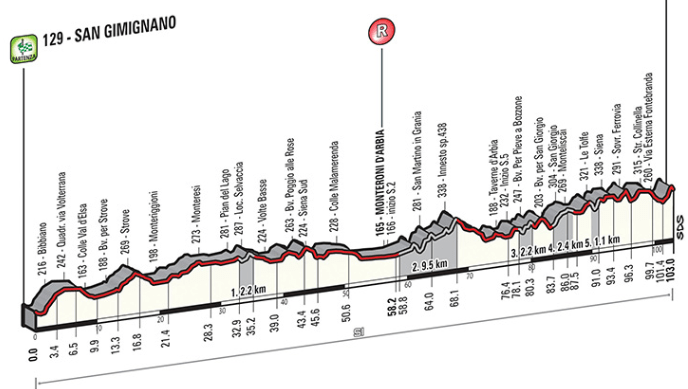 Strade Bianche starts approx 8:30pm AESST, finishes approx 5 hours later approx 1:30am. 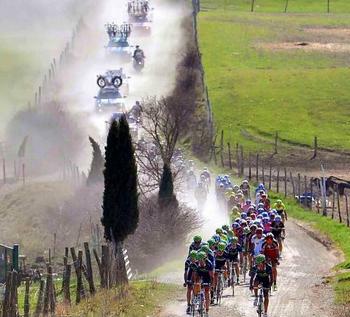 Also follow on twitter under the hashtag #stradebianche. For anyone in Victoria, Australia who wants to tackle an epic one-day gravel classic of their own, I am organising a ride in the next couple of weeks. It’s free for anyone to join. Details here – Strathbogie Slider. If you haven’t already done so, register with road.cc, join the game and join the DTTalk ProCycling League (code 75482). Podium: Stybar, Van Avermaet, Valverde. So my preview was OK. I had first 2 riders in my team, not so good after that though. Sagan and Cancellara were a bit disappointing although they put themselves in lead break so were in contention for a while. We have a bit of a break to the next race – Milan-San Remo on 22nd March. Last week was too hectic for me so I didn’t get a chance to do a preview for Milan San Remo. Podium was Degenkolb, Kristoff and Matthews – I had 2nd and 3rd. – Gent-Wevelgem on Sunday 29th March. Then the Tour of Flanders the following Sunday, 5th April.